Jack Lenz is producing a feature film about the life of Mona Mahmudnizhad and her family. Mona was arrested at the age of sixteen for teaching children who had been expelled from school because of their religious beliefs. Mona and nine other Baha’i women were then executed after refusing to deny their religion and become Muslims. The latest news relating to the production can be found on the Mona’s Dream website. 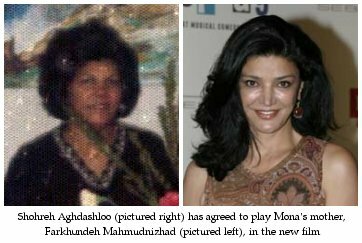 They are currently at the casting stage and Shohreh Aghdashloo, who starred in House of Sand and Fog and 24 (Day 4) has agreed to play Mona’s mother, Farkhundeh Mahmudnizhad.The web site includes short profiles of each of the ten women martyrs of Shiraz, including Mona and Shirin (my wife Ladan’s aunt) and includes several beautiful pieces of music written about their and Mona’s sacrifice. You can also view Doug Cameron’s video of “Mona and the Children” on the site. I think it is wonderful that this film is being made. The world needs to know the suffering the Iranian Baha’is have had, so maybe Iran will finally cease its inhumane policies towards us. Watching the video again, after all these years,and reading about Mona, brought tears to my eyes, and comfort to my soul, knowing that there are many who still have such a strong conviction in their faith, even though many pay with their death, even in 2007. The world is coming to an end, with those who speak of truth and justice, and at the same time, condemn those who believe and live their faith. Mona is a shining light, and my 17 year old daughter will be given Doug’s song, and shown her story so that she can understand that this is real courage of ones convictions, at a time when it is “cool” to not have any values at all.